Who doesn’t love a cute little kitten? 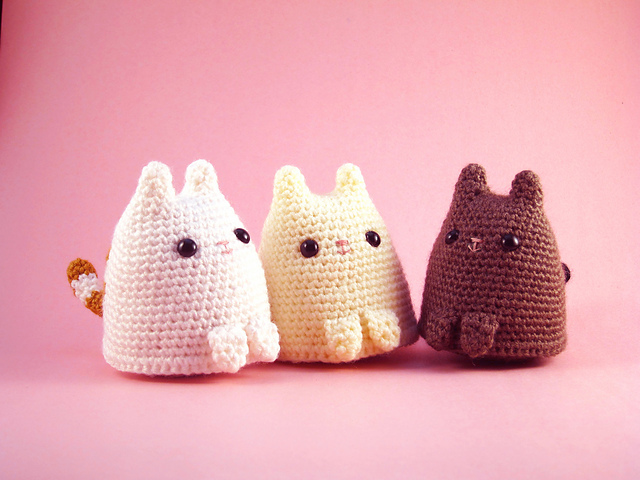 With the free Dumpling Kitty crochet pattern, you can have a tiny kitten that will never grow up. They’re adorable little bundles of fluff that will make anyone smile. They’d make great party favors, as well as paperweights, keychains, or toys for little ones. With their small size and minimal assembly, you could be a crazy cat lady in no time. You only need to know two crochet stitches making this an easy pattern for beginners, even with the embroidery and sewing: single crochet and increase. You’ll also need to know how to change colors, but if you haven’t done that before, you can either forego the stripes or look at the photo tutorial provided in the pattern. It’s worth knowing how to do if you ever want to add stripes into other patterns, and won’t take too long to learn, so I recommend putting the time in if you haven’t already. 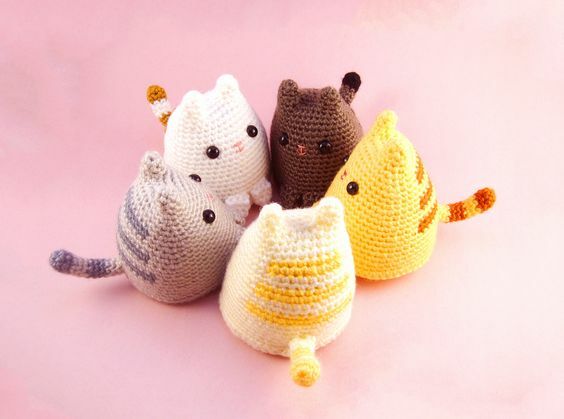 You’ll be crocheting individual parts (tail, feet, body) and then sewing them together at the end, all of which is covered in detail and includes plenty of close-up photos, so don’t feel too intimidated if this is your first amigurumi project. It’s one of the simpler patterns, and the photos and instructions are very clear and helpful. During the assembly you’ll also be adding in the eyes and embroidering a little pink nose. 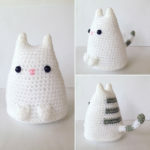 Of course, you can leave those parts off and have a faceless kitty, or embroider the eyes as well as the mouth, or you can add googly eyes or buttons (if you want a Coraline-esque kitty). 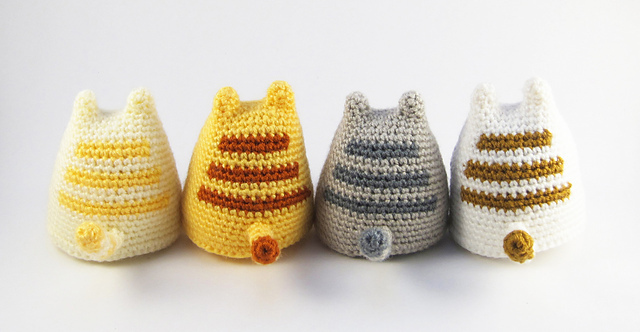 Put your own spin on these kitties with colors, accessories, and sizes. 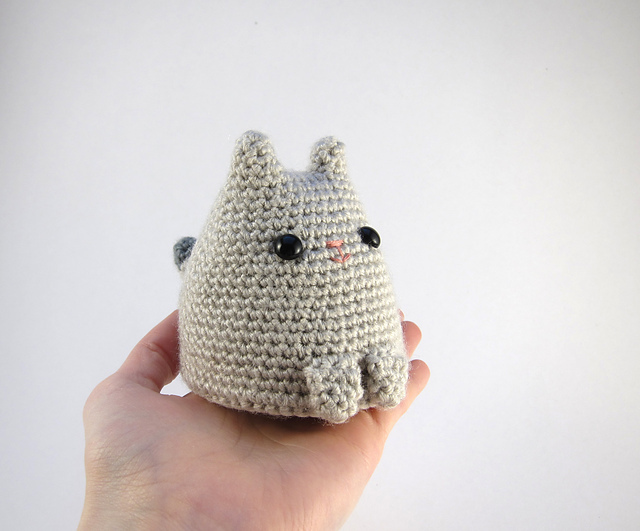 The dumpling kitty is one of the cutest, easiest amigurumi patterns I’ve seen online, and with a free afternoon you can have one of these little kitties done before dinnertime. 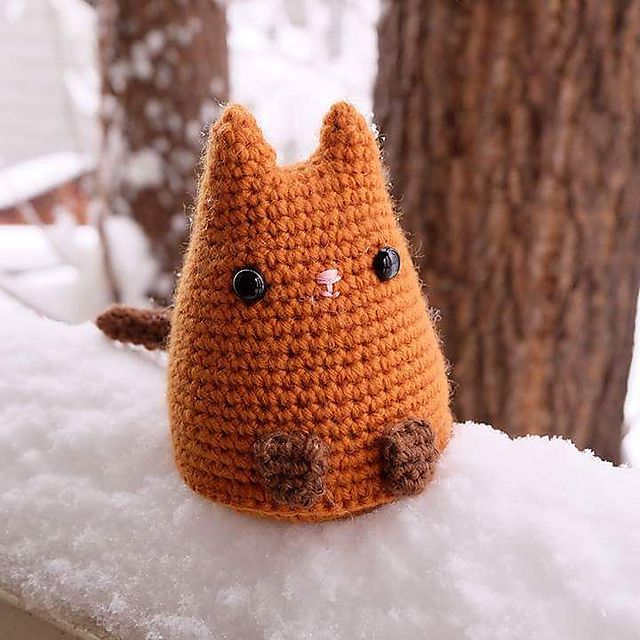 If you do hit a snag, however, the author (Critterbeans on Ravelry) has included her e-mail in case you need to ask a pattern question. 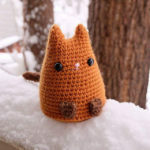 You can also view her crochet patterns on Ravelry, which include other adorable amigurumi creations, such as dinosaurs, sloths, pandas, pigs, foxes, dolphins, and even some Animal Crossing critters. If you’re an animal lover and want to create your own dumpling kitty family, you can find the free pattern from Sarah Sloyer at Ravelry as a free PDF download.